One film that is making waves even before its release is Prabhu Solomon's Tamil movie Mynaa. The film was in the news when producer-distributor Udhayanidhi Stalin grabbed the film for distribution saying he couldn't sleep after watching Mynaa. At the audio launch, actor Kamal Haasan showered praise on the film saying, "I slept well after watching the film because I was happy that good films were still being made." Now a lot of hype is surrounding this realistically shot small film which is expected to make waves this Deepavali in Tamil Nadu. Prabhu Solomon, the director, is not perturbed by the hype but happy that his sincere efforts are being appreciated. Over to Prabhu Solomon. It was reported that Udhayanidhi Stalin was so impressed by your film that he immediately took it for distribution. How did you make him see the film? I must thank Vijay TV for the opportunity. They bought the satellite rights of Mynaa. Mahendran of Vijay TV is a friend of Udhay sir, so he arranged for him to see the film. As there was no theatre on that day, we had to have a show at AGS Aghoram's house. He also watched the film with Udhay sir. They watched the film on a Saturday and signed on Monday for the distribution rights. Did you expect this kind of a response from them? We had worked really hard to make it look different and we were hopeful that people would talk about it but we never expected this kind of response. It is all due to god's grace. How did you feel when Kamal Haasan praised the film at the audio release function? Similarly, Bala sir also took me to his office after watching the film and had tea with our team. They are all legends in Tamil cinema and had the magnanimity to appreciate the work done by the next generation film-makers. Yes, all this appreciation made me a little nervous. D Imam is the music director. If you see the film, you will know that the film is fully packed with sound and light. There are very few dialogues. I used music to enhance the expressions. Like you see in Titanic, music is an integral part of Mynaa also. Why did you decide to shoot the film in an unexplored place like the forest? I didn't want to be a film maker sitting in Chennai and making my films. My previous films -- Kokki, Lee and Laadam -- were Chennai-based films. I know every nook and corner of Chennai so am bored of it. I have also seen most of the villages in Tamil Nadu. So, I wanted to show a place that has not been explored or shown till now. It is a very small village called Kurungani, 40 km from Bodinaykanur. I was standing in a corner in Munnar (hill station in Kerala) when I saw a small village nestled in a valley covered by mist. 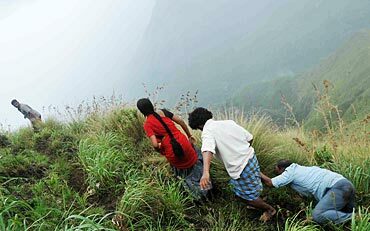 The place is called Kurungani situated on the Tamil Nadu-Kerala border. It looked like a place in Scotland, surrounded by hills, all green and full of mist. I was told that I had to travel down five hours to reach the place. Jeeps also can't go deep inside the village. After a certain distance, we trekked to reach the unexplored interiors. When I saw the place, I was sure that it was where Surili and Mynaa were born, grew up, met, lived and fell in love. It was like a magical place where Adam and Eve met. There was no pollution that we see in cities; only trees, flowers, the mist and air that smells of nature. What came first, the characters or the backdrop? The characters. I wanted a fresh place where I could place them. Once I chose the place, I made some changes to the screenplay and dialogues as the village is on the Tamil Nadu-Kerala border. After crossing the border you enter Kerala where people speak in Malayalam. These are the kinds of changes I had to make in the script. In Munnar too, people speak a mix of Tamil and Malayalam. When they are in Kerala, the people they meet are Malayalis and to make it look realistic, I made the people of that area act in the film. Everything about the film is real. We couldn't carry lights and other paraphernalia. So, we shot the film with available light only. You said the film was entirely shot in available light. Tell us something about the cinematographer. His name is Sukumar. He was confident that we could shoot the film in natural light. I would okay the scene and he would shoot. We were not apprehensive that the scenes wouldn't come out good. We shot the film in October-November. So, there was no harsh light. It was easy to shoot in cool, mild light. Would you say music, nature and light are like characters in the film? Yes, all these are like characters in my film. There are no heroes, heroines or villains in the film. I can confidently say that the fulfilment you feel after reading a novel will be there in this film. It is not an art film; it is a commercial love story, a musical love story but made realistically. We have not applied makeup to anyone in the film. There are no artificial costumes, no duets, no group dances, no comedy scenes -- yet it's a commercial film. What is commercial about the film? If you can entertain the audience for more than two hours, which I think the film will, that is commercial. The film will make people laugh and cry and get emotional. I am sure Mynaa will be a trendsetter. I was sure that no producer would come forward to produce this film. Even if someone did, he would start pressurising me to have commercial elements in the film. I had to make such compromises in my earlier films. So I started a production house with my friend John Max so that I could make a film like Mynaa without anyone forcing me to do things that I didn't want. It is not a story that I can narrate for two and half hours. It would be over in 5 minutes. How do I explain light and music to a producer? Did you visualise the entire film with music and light when you went to the location? The entire film was in my mind with light, mist and music. Whatever extra nature gave me, I picked up gratefully. I would say it's a totally experimental film. Was the village exactly the way you had visualised it? I travelled around 11,000 km to find the right location to shoot. When I saw this village finally, I knew it was where Surili and Mynaa lived. I went to Vagamon, Idukki and Adimaali to visualise the journey Surili and Mynaa undertook. When you went in search of a place where Surili and Mynaa grew up, were you expecting to find Kurungani from Munnar? Not at all. I will call it a miracle that I chanced upon this place. All I can say is that it was a divine place pointed to me by God. Would you be making such realistic films again? Definitely. The appreciation I got from great people like Kamal sir and Bala sir has given me encouragement to tread the same path.